Did you know that drowning is one of the leading causes of death in children under the age of five? It is sad but true. And, in most cases, the children were well-supervised. According to a study conducted by the Consumer Product Safety Commission (CPSC), supervision alone can and does fail. The best way to ensure your children are safe is to install a Pool Fence. A pool fence can help lower your insurance. A pool fence can help keep debris from finding its way into your pool, making cleaning a breeze. A pool fence helps add privacy to your pool. Residential swimming pools in Northern Virginia are subject to Section 421.10.1 BOCA National Building Code. All in-ground, above ground or on ground pools, hot tubs or spas require a pool fence or other barrier measuring at least 48 inches in height, with a 2 inch maximum vertical clearance between ground level and the fence and spacing between vertical planks should not exceed 1-3/4 inches in width. Furthermore, all gates need to be self-latching and open outward. 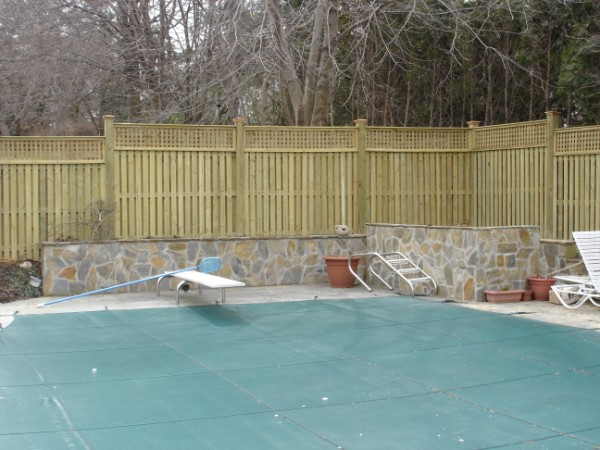 Hercules Fence can handle all of your fencing needs, including Pool Fences. We have been providing professional service and quality installation for both commercial and residential fences throughout Maryland and Northern Virginia since 1955. We take great pride in our work. So why would you trust anyone else with such an important job, like protecting your family? If you have any questions about our blog, “Pool Fence Basics: Add Safety and Curb Appeal to Your Home,” please contact Hercules Fence of Manassas, Virginia today by calling (703)551-2609 or visiting our website. Also, check out Hercules Fence of Manassas on Facebook,Twitter, Google+ and YouTube! This entry was posted on Friday, June 14th, 2013 at 2:43 pm. Both comments and pings are currently closed.